Detox products: Laboratory 6 Parameters Urine Drug Test. Pass drug tests, passing all drug test. The advantages of establishing a Corporate Drug Free Workplace Program has been clearly documented by lower accident rates, lower employee turnover, and lower workman's compensation insurance claims. The first step in your Corporate Drug Free Workplace (DFW) program is to reduce the cost, hassle, and turnaround time of "drug testing". 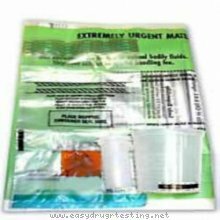 The best way to do this is by using the Lab Drug Test Kit. KIT UNCLUDES: - SPECIMEN COLLECTION CUP WITH A TEMPERATURE STRIP - CONTAINER AND BIOHAZARD PROTECT ENVELOPE - ADDRESSED AIRBORN EXPRESS ENVELOPE - CHAIN OF CUSTODY FORM - MRO SERVICE AVAILABLE - 10 PARAMETERS TEST AVAILABLE BY REQUEST Attention! Please follow the instructions carefully in filing out the Chain of Custody form and preparing the specimen. If any mistakes are made, the laboratory will not be able to perform the test, and we will not held responsible.